I'm sure I'm not the only person who, after reading the CNN headline "Exercise Can Cancel Out the Booze, Says Study," quietly cheered, "YASSS! I hit the gym today, time for another fish bowl full of wine… or two!" Who doesn't love a good headline that makes questionable habits seem semi-acceptable? Alas, there are these pesky little things called "details," and apparently they're kind of a big deal when it comes to actually understanding what a study says about our behaviors and their outcomes. And since I already rewarded myself with a nice little pour, I turned to (presumably) not-buzzed doctors to help suss out the facts. 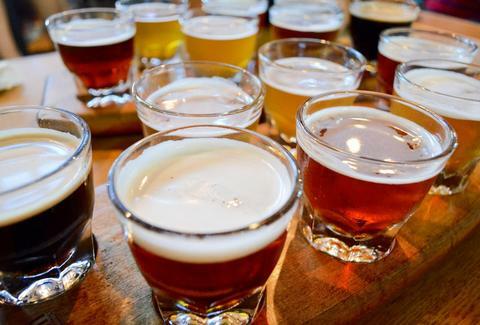 This wasn't a short-term, lab-based study where researchers had participants walk on a treadmill for 30 minutes before filling their pie holes with a few craft brews to see what happened next. No, this was a longitudinal study that monitored health outcomes of participants spanning years of their lives (10 years on average), with the intent of tracking specific behaviors and whether they might be associated with early death. The study found (unsurprisingly) that heavy drinking was associated with a greater likelihood of disease and death. They also noted that all-cause death in moderate drinkers was reduced when participants achieved recommended levels of physical activity, and death from cancer was almost completely nullified. Maybe, maybe not. Dr. Dara Huang, a Manhattan-based internist specializing in culinary medicine, points out, "This is an observational study that suggests that there may be an association between moderate-intensity exercise and lowering the risk of alcohol-related cancers, most commonly, liver cancer. Certainly, further studies would have to be done to see if this association shows causality." In other words, just because there's a positive correlation between exercise and reduced risk of cancer in people who drink, doesn't mean that exercise specifically led to the reduced risk of cancer. There could be other unidentified factors or behaviors that played a part in the association. For instance, people who exercise may manage their stress levels more effectively or make more meals at home than those who don't exercise, both of which could reduce the likelihood of illness or death. In shocking news, this study once again confirms that exercise is good for you. Dr. Jamin Brahmbhatt, a PUR Clinic physician with Orlando Health, puts it simply: "The study confirms what we already know. The more you exercise, the better it is for your health. When you exercise, you have a better chance of living longer, healthier, and happier." What the headlines seem to skim over in their zealous rush to make you feel good about your five-drink Fridays is that the study really highlights the negative impact of heavy drinking -- the study participants who drank the most were more likely to die from all causes and cancer than any other group. Dr. Nesochi Okeke-Igbokwe emphasizes, "This study showed that physical activity did not offset the negative effects of alcohol consumption in those who drank dangerously excessive amounts of alcohol. The study should not prompt anyone to disregard the effects of alcohol consumption on their health just because they regularly exercise." There wasn't a single doctor I spoke with who was adamantly against drinking, although they all warned of alcohol's risks, especially in heavy doses. Dr. Brahmbhatt specifically said, "This study does not give you the OK to drink away. Moderation is key. You have to have a good balance in life decisions." So moderate drinking (fewer than eight standard drinks a week for women and fewer than 12 drinks a week for men) isn't the worst thing in the world, but if you're going to do it, you should add the recommended dose of exercise to your weekly routine. That comes out to about 150 minutes a week, or about 30 minutes a day, five days a week. In other words, this study gave us absolutely no new information. Bummer. Laura Williams is an exercise physiologist and fitness writer who wasn't really drinking while she wrote this article, although she thought about it. Connect on Twitter @girlsgonesporty.